Screen resolutions continue to improve at a phenomenal pace. Just over a decade ago most people were still using 576i and 480i standard definition screens, but after HD went mainstream resolutions of 720p and 1080p have become the norm, and now 2160p is starting to creep in. These new resolutions are normally reserved for larger displays, where the individual pixels don’t have to get too cramped, but a new technology called blue-phase liquid crystals might be about to change all that by changing up how the crystals in liquid crystal displays show color. Using this new technology, the Optical Society reports that pixel per inch density could reach as high as 1500 ppi, three times the density of Apple’s current retina displays. Rather than televisions being the big winner as a result of this technology, new virtual reality screens could see the most improvements as they benefit from fitting as high a resolution as possible into a small screen that sits just inches from the user’s eyes. The effect is achieved through changing the makeup of the crystals that show individual pixels. Current LCD displays use three subpixels (one red, one green and one blue) which act as filters that combine to create various shades when light from an LED backlight is shone through them. However, new blue-phase panels have LEDs that are able to flip between the three colors quickly enough that the human eye perceives just a single color. As a result, no filter is needed at all, massively reducing the amount of space needed for each pixel. This technology has been around since 2008, but it’s only now that researchers have been able to reduce the operational voltage enough to make the displays viable. The next stage will be to produce a working prototype, which researchers predict could happen as early as next year. For all those predicting that it’s only a matter of time before OLED takes over from LCD, blue-phase could be about to make LCD relevant for years to come. 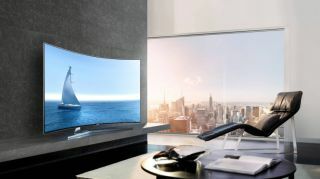 Check out our guide to the best 4K televisions available.